Here at TNL, we love a good makeup party. 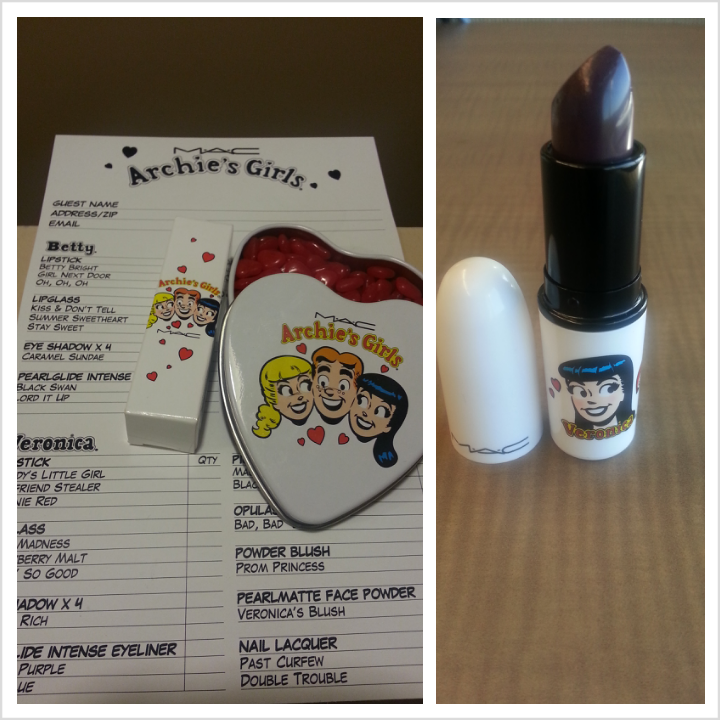 We received an invitation to the launch of the Archie’s Girls collection at MAC Cosmetics Scarborough, and of course we had to go check it out. 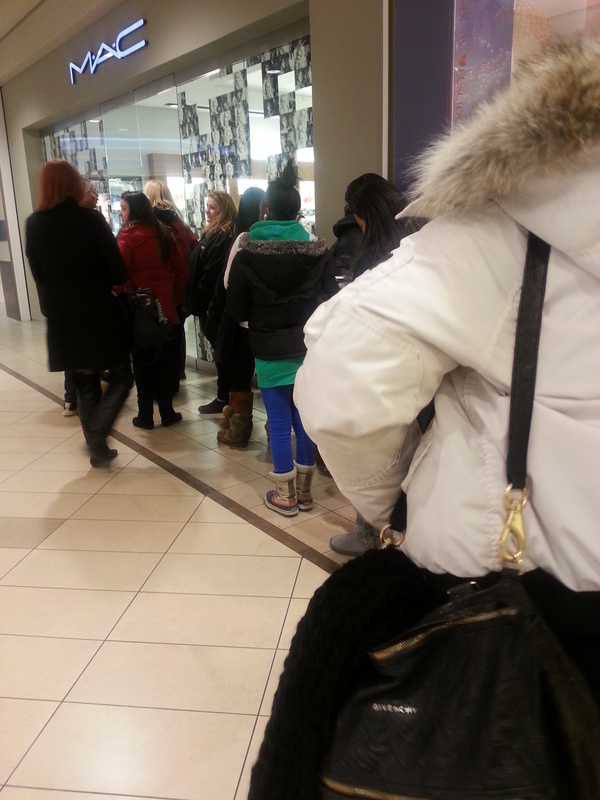 A lineup of eager girls waited outside the store until the doors opened and that’s when we caught our first glimpse of Archie himself. 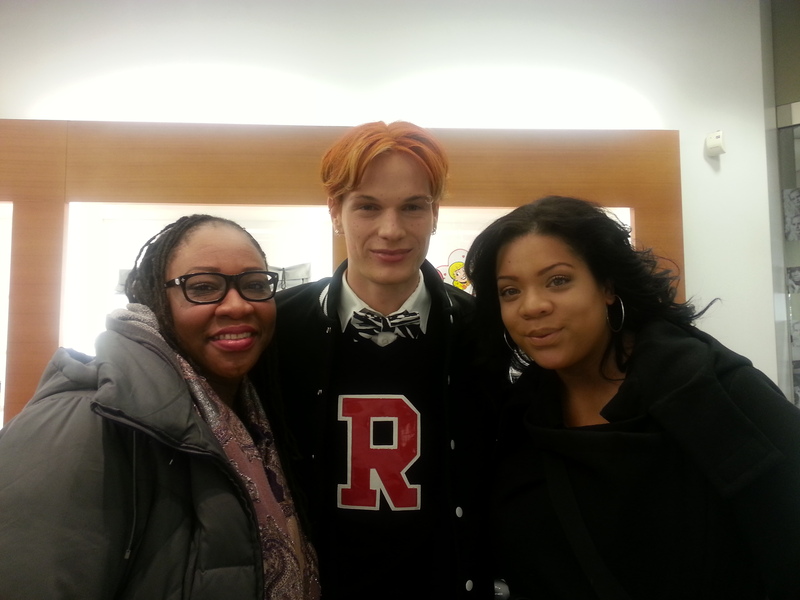 With bright red hair , a bow tie and his Riverdale High letter sweater, he was definitely the man of the hour. We don’t remember comic book Archie having an eyebrow ring , though. 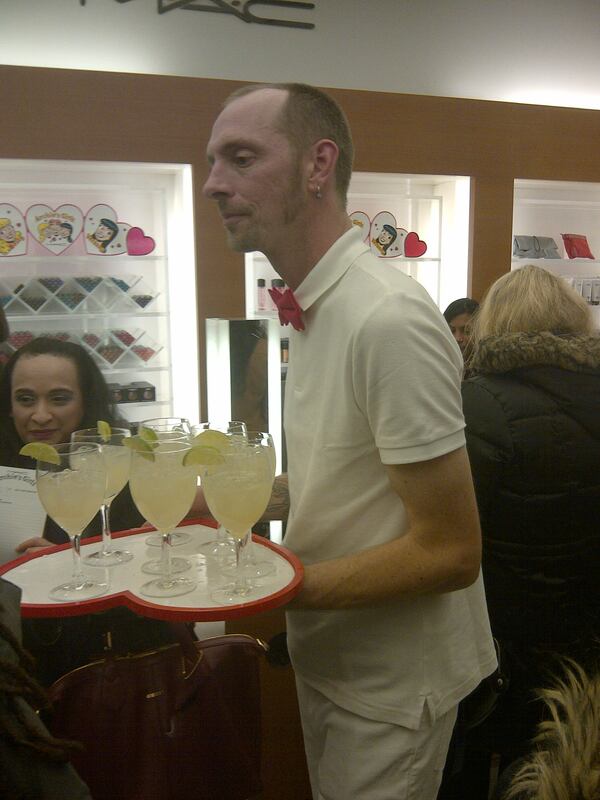 MAC definitely went all out to create the Archie ambiance of the 1950’s but with a modern flair. 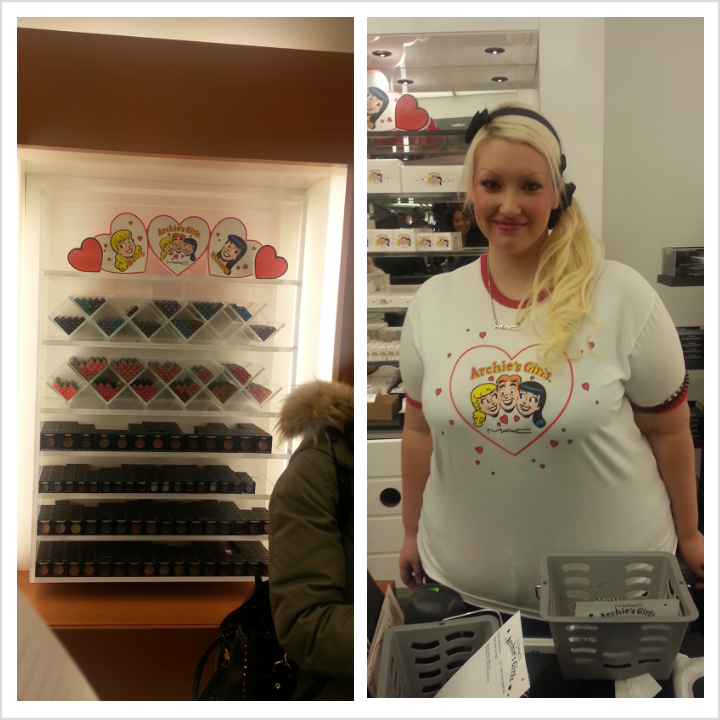 The collection sat in a display of cinnamon hearts, and the MAC artists wore the cutest Betty and Veronica tees. Servers dressed as staff of Pop’s Soda Shoppe in the Archie comics would have, offered mini hotdogs, potato skins and cocktails to the excited attendees. The Archie’s Girls collection is made up of two sets of colours. One side is for all of the “Bettys”, and the other for “Veronicas”. The Betty colours were neutral with lots of browns, pinks and corals. Her brunette counterpart’s colours were deeper and more vibrant red and purples. We have to say, we did not instantly see any colours in this line and get that “had to have” feeling we are all too familiar when it comes to MAC products. In fact, most of them would not have been flattering on our skin tones. I guess we may have to wait for the Nancy collection. 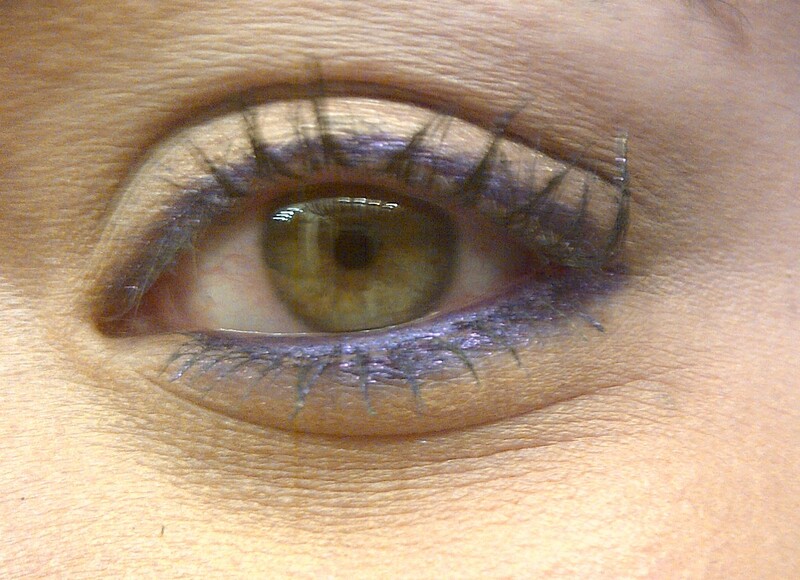 We did however, fall in love with the Pearlglide Intense Eye Liner in Designer Purple. It goes on like butter and apparently wears for 9 hours. Ash was sold. And seeing as neither of us could pull off any of the Betty shades, after a bit of contemplation Chris settled on Veronica’s “Boyfriend stealer” lipstick. With our purchases, we were given cute little tins of cinnamon hearts for the road. If for nothing else, the packaging is very cute. But for us the highlight of the evening was definitely meeting Archie though, we won’t lie. MAC did a great job of taking a classic icons like the Archie characters and making them modern. The event was fun and we are so glad to have attended. 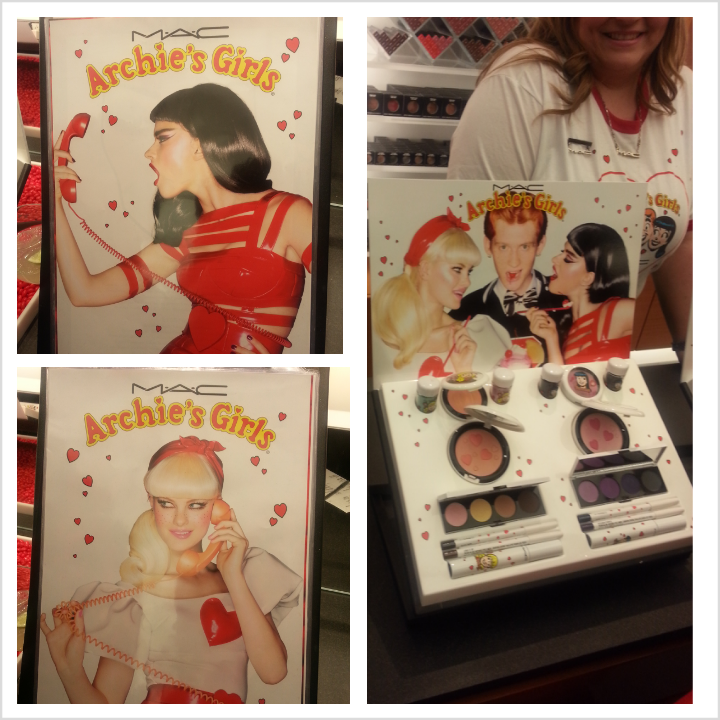 If you have your eye on any of the Archie’s Girls products, act now as MAC limited edition collections sell out quickly! So cute! Thanks for doing the leg work for us! The Ronnie Red lipstick looks cute. I may have to check it out in person. I am on the prowl for a great liquid eyeliner. Did this Mac collection have anything new? ps – I used to be the biggest Archie comics fan! I would always beg my mom to get me the latest edition while we were standing in line at the checkout. Or borrow old (vintage?) ones from the library! pps – Team Betty all the way. You know how I feel about Betty and Veronica. This is just fab. Love the liner, would love it in black! Thanks for the intel, ladies! I will definitely have to keep my eye out for this line. Yay Archie! Too bad the line isn’t flattering to warmer skin tones because MAC has always been a leader in offering makeup for all skin tones and types – being a brown girl myself I have always appreciated finding my exact match at MAC. I noticed in a previous post that someone was looking for a great liquid eyeliner – I absolutely adore Stila waterproof liquid eyeliner. A close runner up is also Kat Von D tattoo liner. Agreed. Usually MAC is really great at covering all the bases with a diverse color range. We are glad to know that even if we didn’t find much from Archie’s Girls, the regular MAC collection doesn’t dissapoint. Really enjoyed reading this, especially the eyeliner review & swatches. Looks like I will be visiting MAC very soon 😉 And what a fun event! Keep up the awesome posts! Not big on makeup but this concept is kinda cool. Love the lipstick swatches, especially the pink ones..but I think I love the purple liner more lol…I love all things purple! Cute lipstick choice Chris… boyfriend stealer you!